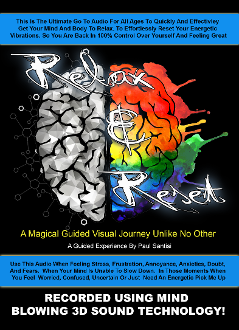 This Relax and Reset Guided meditation is a moving visual journey that will leave you speechless. This is the utimate go to audio for all ages to quickly and effectivley get your mind and body to relax. To effortlessly reset your energetic vibrations, so you are back in 100% control over yourself and feeling great. Use this audio when feeling stressed, frustration, annoyance, anxieties, doubt, and fears. When your mind is unable to slow down. In those moments when you feel worried, confused, uncertain or just need an energetic pick me up. This audio will balance out your energy and then automatically remove negative blocks and leave you feeling great.